Christie Carlson began writing professionally in 2010. She has spent time coaching in the Boise State University and Oregon State University strength and conditioning departments. She is a certified strength and conditioning specialist, USA weightlifting certified and a certified personal trainer. She holds a Bachelor of Science in human biology and a Master of Science in kinesiology from Boise State University. Panini bread can provide a sweet and pleasant taste to your lunchtime sandwich. However, it has a high calorie count and can hinder your attempt to eat healthy. The carbohydrates and calories in panini bread can spike blood sugar and make it difficult to lose weight. One serving of panini bread is one roll, or 150 grams, according to My Fitness Pal. It contains 329 calories. Panini has 49 g of net carbohydrates, according to Carbs-Information. 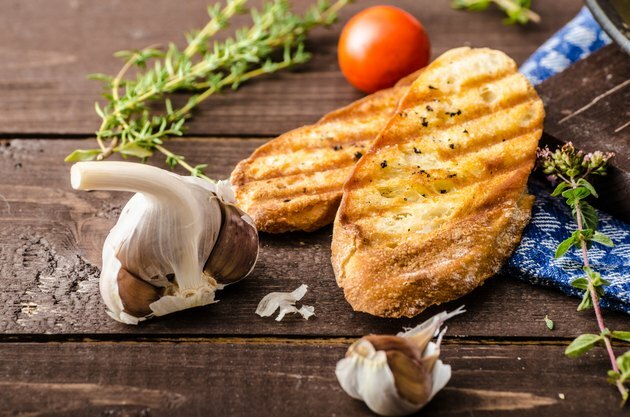 The carbohydrates provide your body with energy, but panini bread is often low in whole grains, so it may cause a spike in your blood-sugar levels. The 330 calories in a serving of panini bread can account for nearly half of your daily recommend amount on the typical 2,000-calorie diet. Panini bread has 10 percent of the daily recommended value of iron and only 1 g of saturated fat per serving. Can Diabetics Eat Rye Bread & Pumpernickel Bread?